In accordance with the dominant position he sought for Germany, Hitler decided to transform Berlin into a new "world capital" on the ancient model. Since the new capital was to be the center of a greater German world empire, Hitler even considered renaming Berlin "Germania." 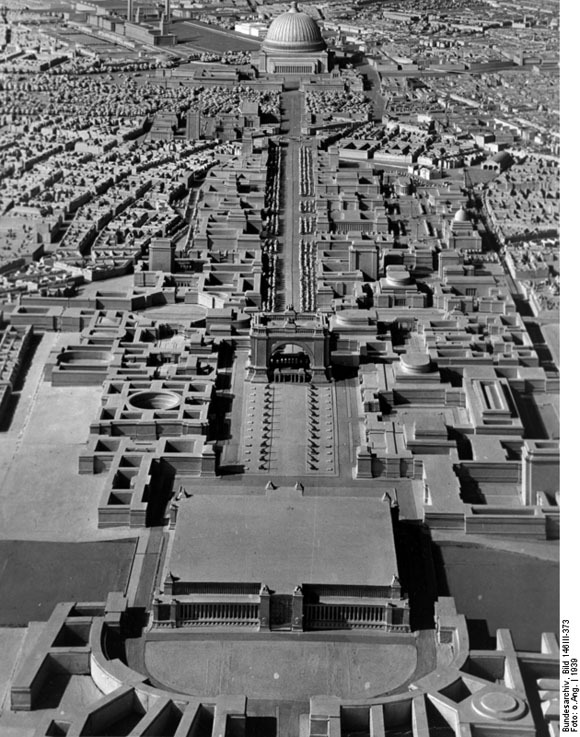 Albert Speer (1905-1981) was chosen as the architect of the new city. After 1933, Speer had quickly become Hitler's favorite architect and had been commissioned to design numerous representative buildings for the Nazi regime in the neoclassical style. In 1937, he was appointed General Building Inspector and was charged with redesigning Berlin and other German cities. His plan for Berlin included two broad traffic arteries on the north-south and east-west axes; the two were to intersect at the Reich Chancellery. The most important component of the "Germania model" was the "Hall of Fame" (also called the "Great Hall" or the "Hall of the People"). It was to be built at the bend in the Spree River, at the north end of the north-south axis (photo: top edge, center). This monumental, domed building of granite and marble was supposed to function as an assembly hall and “place of worship” for the Nazi cult. Had it been built, it would have been able to accommodate as many as 180,000 people, and its dome would have been the largest in the world. The implementation of Speer's plan would have resulted in the complete destruction of the organic structure of Berlin, since it would have required the razing of many buildings and the rerouting of many streets. Work was halted in the spring of 1943 on account of the military situation. (In the meantime, Speer had also been appointed Reich Minister of Armaments and War Production.) Today, some remnants of Nazi architecture can still be seen in Berlin, including the Olympic Stadium and Tempelhof Airport.